This word list goes with the blog article Cooking Up Language with Signs: Peanut Butter Reindeer / Rudolph Cookies. Shape your peanut butter cookie dough on the pan in more of a triangle shape, rather than a circle. This will give you a nice face of a reindeer. Bake the cookies as directed. 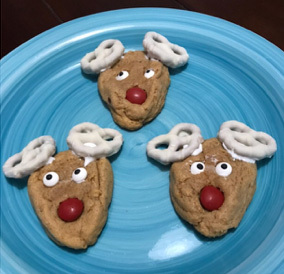 As soon as they are out of the oven, decorate your reindeer cookies. Add the candy eyes, M&M candy noses (use red for Rudolph! ), and pretzels for antlers.